Ace (Collin MacKechnie) is a shy kid who’s just moved into a new town. His mom, Susan (Jodi Sadowsky), is the new music teacher at the school. Ace finds out his grandfather (who lived in Transylvania) passed away and has sent them a dog named Fang. It turns out Fang is super-fast and strong, allergic to sunlight, can only eat jelly, and speaks with the voice of Norm MacDonald. 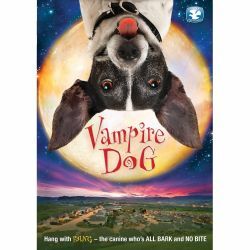 A mad scientist (Amy Matysio) is looking for the formula to create an anti-aging cream and she’s sure vampire dog DNA is the key. I went in to Vampire Dog expecting the sub-mediocrity of A Halloween Puppy (2012). So it was a pleasant surprise to see that unlike David DeCoteau, director Geoff Anderson actually seems to care what is on the screen. Make no mistake, this a feather-light kids movie devoid of any scares or any real threats to our heroes. Aside from the kids going to a school named after Bela Lugosi, and a brief mention of Vlad the Impaler, there is nothing vampiric going on in the movie. The villains are annoyingly unfunny and drag the film to a standstill every time they are the screen. The explanation of why Fang must subsist on jelly borders on clever and there are a couple of jokes that work, but they are few and far between. Norm MacDonald’s natural delivery makes it difficult to tell if he’s just phoning this one in, but he manages to imbue Fang with some personality. If you have small kids or are way too full of Frankenberry to move, this might be an acceptable time-waster during your Halloween festivities.